Ah, comics– such a pleasant reprieve. An avenue of artistic expression where we can trade the drama of the real world for the fantastic departure to a fictional place like Gotham City. …Not this week: DC and Catwoman, specifically, are here to remind you that it’s early November in a presidential election year, so your escapism has been temporarily suspended! Catwoman’s past comes full circle in the mayoral race between the Penguin and Constance Hill. 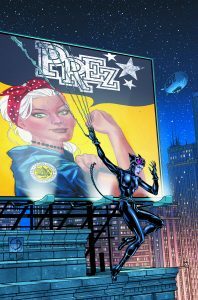 Between Penguin’s dangerous history and rhetoric, and also something awry with Hill, Catwoman resolves to expose truths and ripple the political waters. Meredith Finch (Wonder Woman) takes significant inspiration from campaign trail rhetoric here in Catwoman: Election Night #1. Penguin’s dialogue is often ripped verbatim from the lips of Donald Trump. At one point, the squawking rogue boasts that he’ll build a wall around Gotham to deter criminals. “That I can tell you… Let’s make our people safe again. Let’s make Gotham great again!” Penguin exclaims, complimented with a close up shot of a mad, bulging eye behind his monocle. One’s politics aside, there’s very little subtly here. Given the socio-political state of comics in 2016, chances are that most readers wanted some preaching to the choir in this comic. Prodding of the Republican candidate through the avatar of a comic book villain is amusing here, but Finch could have easily lingered too long and overcooked the joke. Thankfully, the story progresses with ease. Early in the issue, Finch delivers a short-but-sweet vignette of young Selina Kyle that makes Catwoman into a sympathetic figure. This helps to serve Catwoman’s altruism in this comic. Some readers might take umbrage with Catwoman shedding her anti-hero act for ‘good gal’ antics, however, they make sense within the context of the story. Poor Selina Kyle hasn’t been treated very well in comics during past few years, but Finch does a great job of telling a compelling story without over-sexualizing the protagonist. The art team does an overall stellar job, especially with dark pallets and scenes requiring heavy ink saturation. The use of shadows to demonstrate Catwoman’s feline qualities are a nice touch, as it’s noticeable without being too distracting. The artwork’s overall tone has a DC house style feel, but doesn’t feel like a mere clone of other art teams’ work. Selina’s costume design is sleek, practical and attractive, yet doesn’t egregiously focus on her figure. Thankfully, unlike the Death of the Family storyline from the New 52, there are no splash pages that focus on her derriere. Buy. If you picked this up, then you wanted to read something political this week. Well, you got what you wished for: a Catwoman story involving crime in Gotham City’s upper crust political intrigue. The price point is steeper than usual at $4.99, but at the same time, there’s bonus content from the Prez series after Catwoman’s issue wraps. Readership gets a little bit of young Selina and a big chunk of Catwoman clawing at crime in high places. The cherry on top? Donald Trump’s words coming out of the Penguin’s mouth. Additionally, a lot of artists come together to create spectacular visuals throughout the issue. Max has always had a passion for storytelling, and has studied it twice: first with a B.A. in history and later with an M.A. in multimedia journalism. He works in communications and lives in Queens, the finest of New York City's five boroughs. Max insists that villains are almost always more interesting than heroes. In his spare time, Max enjoys traveling, discovering new music, and as you can see, a good joke.